Paul Millsap scored a season-high 33 points to lead the Hawks, while Al Jefferson had 24 points and 23 rebounds for the seventh 20/20 game in Bobcats history. ATLANTA — The Hawks are making a habit out of overtime, and the Bobcats are making one out of dropping close games. 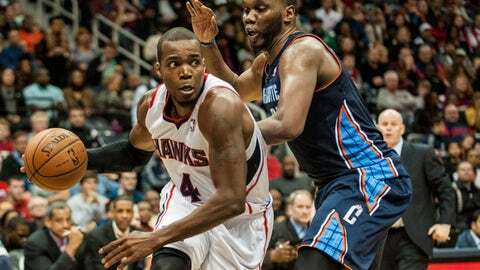 For the third straight game they played past regulation, getting a 33-point, 13-rebound performance from Paul Millsap in the absence of Al Horford as they edged the Bobcats 118-116 in overtime Saturday night. "We’ve got to get it done in four quarters," joked guard Lou Williams, who had 28 points, including 10 in overtime, off the bench. The two-point loss was the second is as many days for Charlotte as the fell to Thunder 89-85 and it was the ninth of their 17 losses decided by seven points or less. "We had a chance to win, but we didn’t make the plays," said Bobcats coach Steve Clifford. "I just told (the team) that we have to get past the point where everybody’s happy with the fact that the Bobcats aren’t getting beat every night, because we’re better than this." Here are three observations from the Southeast Division clash. Atlanta made it 10 straight in the series, but against a vastly improved Bobcats team — one that, given the loss of Horford, was built to give the Hawks fits — this was very different than the previous meetings in Philips Arena. The Hawks had won their last four home games vs. the Bobcats by an average of 20.7 points. But with Al Jefferson setting the tone inside as he had 24 points and 23 rebounds, just the seventh 20/20 game in franchise history, Charlotte led by 10 in the first half and by 14 with 4:19 to play in the third quarter. But the lead fell away as the Hawks went on a three-point barrage (more on that later) to force overtime and behind a defense that held the Bobcats to 4 of 13 shooting after regulation, dropped Charlotte to 0-8 in Southeast games. It joins the Grizzlies as the only teams to have yet to win within the division. "They hit some open shots, but we were right there at the end of this game," Jefferson said. "We had a chance at the end of the game and the end of the overtime, but it just didn’t work out for us." Playing for the first time Horford suffered a torn right pectoral muscle Thursday against the Cavaliers, an injury that could sideline him for the reminder of the season, it’s clear the Hawks are going to have to go with a rotation to make up for the loss of the two-time All-Star. It’s also clear they won’t be getting the same level of production on both ends than they were getting out of Horford, who in topping the team in points (18.6) and rebounds (8.4) was one of just six players in the NBA to top the roster in both categories. He’s also among the league’s better defenders at the rim, holding opponents to 47.8 percent. Veteran Elton Brand got the start, with Pero Antic and Gustavo Ayon also part of the rotation. Antic saw the brunt of the minutes with 22, while Brandon played 19 and Ayon four. They combined for six points, 10 rebounds and nine assists. The order wasn’t necessarily a sign of things to come, with coach Mike Budenholzer saying before the game "We’ll see how the group fits and what is best for our group going forward." Brandon, Antric and Ayon had their troubles with Jefferson, who shot 10 of 18 from the field in recording his fifth double-double of the season. He scored nine of those points in the first quarter, with seven of them coming with the 34-year-old Brandon on him. Millsap made up for Horford’s absence with his season-high points total, a strong showing considering the emphasis that will not be placed on him to provide the offensive punch down low. "We’re going to miss Al, but for us to just dig down deep and come back, we were down by 14, that’s real good for us," said reserve Mike Scott. Kyle Korver added some drama in his latest extension of his NBA-record streak of games with at least one three-pointer, going three quarters without a trey. But he broke through one minutes and 13 seconds into the fourth, shaking off a defender to hit a 24-footer that pushed his record to 99 consecutive games. Korver’s three was one of seven the Hawks connected on in a 13-minute span, one of 11 they hit in the second half and one of 16 in all. This from a team that entered the game sixth in the league in hitting 9.1 a game. Jeff Teague and Lou Williams each hit a game-high four three-pointers, while Scott added three in an 18-point effort and Korver had two. Maybe the most unexpected of those threes came from Antic, who is hitting 0.6 a game, but delivered a running-shot off one leg with 3.1 seconds remaining to tie the game 101-101 and force overtime. "It’s perfect," Antic said. "A perfect feeling." There must have been something in the air as the Bobcats, who rank last in the NBA at 4.8 per game hit 10, led by four from Anthony Tolliver, while Kemba Walker hit three.